On Friday, August 17, girls ages 6-17 and their families joined us for a Wild Skills Adventure at Crystal Mountain. SheJumps Wild Skills Adventures are open community events where parents/chaperones participate with the girls. Throughout the adventure, participants are introduced to a range of technical and survival skills girls need to get out and adventure. The event start was a rolling one with groups showing up as they want between 9:30 am – 11:30am. At registration they received a specialized Wild Skills Journal & Adventure map which guided them throughout the event. First stop of the day was 10 Essentials & Leave No Trace at the base area presented by Clif. 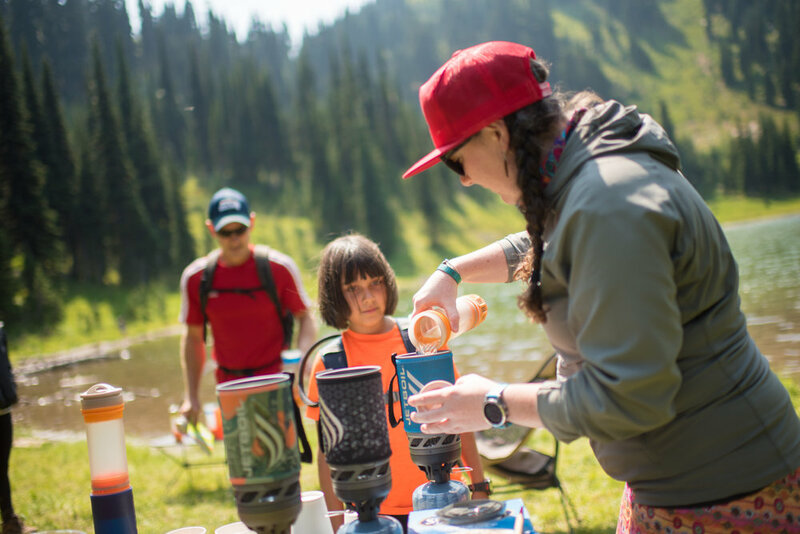 SheJumps ambassador, Cheryl Kochevar, and volunteers did a gear check with each group, loaded them up with Clif Z bars, GoGo Squeez snacks and a journal as well as taught them how to protect the beautiful places they visit along the trail. After completed, they mosied over to the gondola for a ride to the summit. After the laid back gondola ride, participants were treated to a full view of Mt. Rainier from the summit of Crystal Mountain topping out at an elevation of 6,872 feet. This was a unexpected treat seeing as the days before were filled with smoke from the wild fires. After soaking up the view, they traveled the ridge to the top of the Green Valley chair where Ranger Catherine was waiting to teach them all about wildlife in our area. This station was presented by Mt. Rainier National Park’s Education Department. This was a self directed station where groups found a directional sign, colored pencils and the sounds of nature. Participants were instructed to record all the sounds around them – interpreting the sounds and drawing images in their Wild Skills Journal. Groups followed the Crystal Mountain Trail route to the next station: First Aid. Headed up by Wild Skills Coordinator for Washington, Kristen Kochevar, the first aid station helped girls understand what they can do to stay safe on the mountain as well as what to do in an emergency. Reviewing how to safely assess a scene, do a complete body check and call for help as well as learning useful splints and how to properly tie a sling. Halfway down the summer trail, groups encountered a small trail leading up to Elizabeth Lake where the Water Purification Station presented by Yukon Trading Company was located. When you first arrived, Amy Cook & Megan Davin, gave you the breakdown of why we filter water and clearly represented all the bad stuff that can reside in water. Next, the girls got to filter water with Ultra-Light purification water bottles, a genius product from Grayl that easily does the process for you. After filling water bottles, the girls learned how to use Jet Boil stoves to heat water and create their own hot chocolate treat. Special thanks to Yukon Trading Company for going above and beyond with this rad station that was a favorite of many I talked to! The Shelter Building Station presented by Arc’teryx Seattle located at Henskin Lake was the last technical station the girls came across. This ended up being a great place for many groups to take an extended break – enjoying lunch and even some swimming. After recharging with snacks, they were greeted by the volunteer team who handed them a mixed bag of items and tasked with building a survival shelter. Each group worked from the information in the Wild Skills Journals and was given tips & tricks by volunteers throughout the building process. There were many creative solutions! The remainder of the trail passed through old growth forest, an old mining camp, waterfalls and even traverses a ski run called Gold Hills which participants could catch a glimpse of the wrap party. After completing the trail, girls were greeted by the giant inflatable CLIF arch, high fives, face painting, treats from CLIF, lawn games and food! 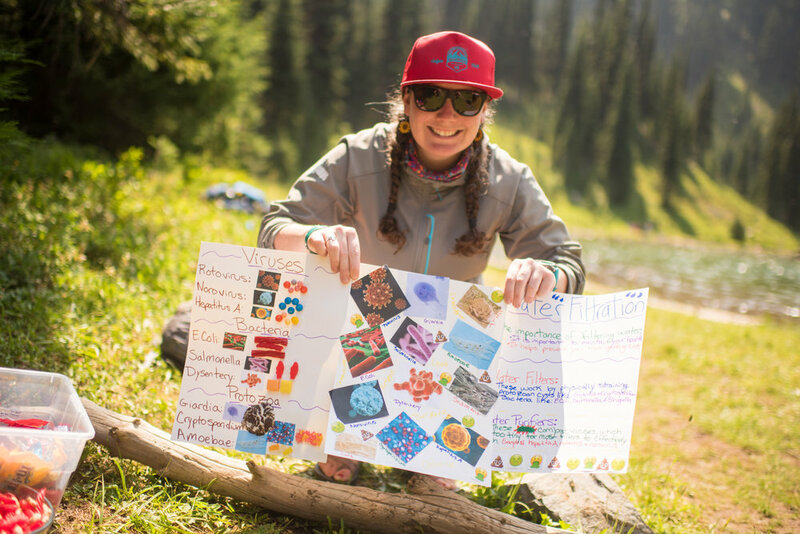 Upon completion of stations, girls received a sticker marking they did it, at the end of the trail girls turned in their maps for a chance to win prizes. The free drawing included fabulous prizes from Arc’teryx, CLIF, K2 Sports, She Emerges and more of our rad partners! Wild Skills at Crystal Mountain was made possible thanks to our generous partners and by our dedicated and hard working PNW team of volunteers who gave their time to help make this an event the participants will never forget. Thank you to all who helped make this such a special event for these young ladies and their families!